For five years after publication of Howe’s Mormonism Unvailed on Nov. 28, 1834, Rigdon and Smith provided no written rebuttal to that book’s central thesis, i.e. that Rigdon had modified Spalding’s work to create The Book of Mormon. 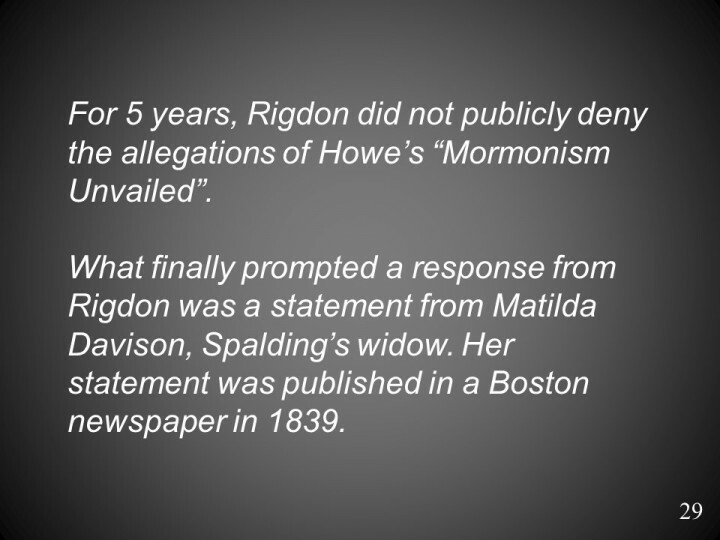 On May 27, 1839, however, Rigdon finally wrote a denial, accompanied by a vicious attack upon Matilda Spalding Davison (Solomon Spalding’s widow) after she had provided a statement to the Boston Recorder (April 19, 1839) implicating Rigdon in the fabrication of The Book of Mormon. As this book has excited much attention, and has been put [forth] by a certain new sect, in the place of the sacred Scriptures, I deem it a duty which I owe to the public, to state what I know touching its origin. That its claims to a divine origin are wholly unfounded needs no proof to a mind unperverted by the grossest delusions. That any sane person should rank it higher than any other merely human composition is a matter of the greatest astonishment; yet it is received as divine by some who dwell in enlightened New England, and even by those who have sustained the character of devoted Christians. Learning recently that Mormonism had found its way into a church in Massachusetts, and has impregnated some of its members with some of its gross delusions, so that excommunication has been necessary, I am determined to delay no longer doing what I can to strip the mask from this monster of sin, and to lay open this pit of abomination. Rev. Solomon Spaulding, to whom I was united in marriage in early life, was a graduate of Dartmouth College, and was distinguished for a lively imagination and a great fondness for history. At the time of our marriage, he resided in Cherry Valley, N.Y. From this place we removed to New Salem, Ashtabula county, Ohio; sometimes called Conneaut, as it is situated upon Conneaut Creek. Shortly after our removal to this place, his health sunk, and he was laid aside from active labors. In the town of New Salem, there are numerous mounds and forts, supposed by many to be the dilapidated dwellings and fortifications of a race now extinct. These ancient relics arrest the attention of the new settlers, and become objects of research for the curious. Numerous implements were found and other articles evincing great skill in the arts. Mr. Spaulding being an educated man and passionately fond of history, took a lively interest in these developments of antiquity; and in order to beguile the hours of retirement and furnish employment for his lively imagination, he conceived the idea of giving an historical sketch of this long lost race. Their extreme antiquity of course would lead him to write in the most ancient style, and as the Old Testament is the most ancient book in the world, he imitated its style as nearly as possible. His sole object in writing this historical romance was to amuse himself and his neighbors. This was about the year 1812. Hull’s surrender at Detroit, occurred near the same time, and I recollect the date well from that circumstance. As he progressed in his narrative, the neighbors would come in from time to time to hear portions read, and a great interest in the work was excited among them. It claimed to have been written by one of the lost nation, and to have been recovered from the earth, and, assumed the title of “Manuscript Found.” The neighbors would often inquire how Mr. S. progressed in deciphering “the manuscript”, and when he had sufficient portion prepared he would inform them, and they would assemble to hear it read. He was enabled from his acquaintance with the classics and ancient history, to introduce many singular names, which were particularly noticed by the people and could be easily recognized by them. Mr. Solomon Spaulding had a brother, Mr. John Spaulding residing in the place at the time, who was perfectly familiar with this work and repeatedly heard the whole of it read. From New Salem we removed to Pittsburgh, Pa. Here Mr. Spaulding found an acquaintance and friend, in the person of Mr. Patterson, an editor of a newspaper. He exhibited his manuscript to Mr. P. who was very much pleased with it, and borrowed it for perusal. He retained it a long time and informed Mr. S. that if he would make out a title page and preface, he would publish it and it might be a source of profit. This Mr. S. refused to do for reasons which I cannot now state. — Sidney Rigdon,* who has figured so largely in the history of the Mormons, was at this time connected with the printing office of Mr. Patterson, as is well known in that region, and as Rigdon himself has frequently stated. Here he had ample opportunity to become acquainted with Mr. Spaulding’s manuscript and to copy it if he chose. It was a matter of notoriety and interest to all who were connected with the printing establishment. At length the manuscript was returned to its author, and soon after we removed to Amity, Washington county, Pa., where Mr. S. deceased in 1816. The manuscript then fell into my hands and was carefully preserved. It has frequently been examined by my daughter, Mrs. McKenstry, of Monson, Mass., with whom I now reside, and by other friends. — After the “Book of Mormon” came out, a copy of it was taken to New Salem, the place of Mr. Spaulding’s former residence and the very place where the “Manuscript Found” was written. A woman preacher appointed a meeting there, and in the meeting read and repeated copious extracts from the “Book of Mormon.” The historical part was immediately recognized by all the older inhabitants, as the identical work of Mr. S., in which they had been so deeply interested years before. Mr. John Spaulding was present, who is an eminently pious man, and recognized perfectly the work of his brother. He was amazed and afflicted, that it should have been perverted to so wicked a purpose. His grief found vent in a flood of tears, and he arose on the spot, and expressed to the meeting his deep sorrow and regret, that the writings of his sainted brother should be used for a purpose so vile and shocking. The excitement in New Salem became so great, that the inhabitants had a meeting and deputed Dr. Philastus Hurlbut, one of their number to repair to this place and to obtain from me the original manuscript of Mr. Spaulding, for the purpose of comparing it with the Mormon Bible, to satisfy their own minds, and to prevent their friends from embracing an error so delusive. This was in the year 1834. Dr. Hurlbut brought with him an introduction and request for the manuscript, signed by Messrs. Henry Lake, Aaron Wright and others, with all whom I was acquainted, as they were my neighbors when I resided in New Salem. I am sure that nothing could grieve my husband more, were he living, than the use which has been made of his work. The air of antiquity which was thrown about the composition, doubtless suggested the idea of converting it to the purposes of delusion. Thus an historical romance, with the addition of a few pious expressions and extracts from the sacred Scriptures, has been constructed into a new Bible, and palmed off upon a company of poor deluded fanatics as divine. I have given the previous brief narration, that this work of deep deception and wickedness may be searched to the foundation, and its author exposed to the contempt and execration he so justly deserves.